The Boeing E-4 Advanced Airborne Command Post, with the project name "Nightwatch", is an aircraft operated by the United States Air Force (USAF). To create the E-4 series, four Boeing 747-200B airframes were specially modified to serve as a survivable mobile command post for the National Command Authority, namely the President of the United States, the Secretary of Defense, and successors. The four E-4Bs are operated by the 1st Airborne Command and Control Squadron of the 55th Wing located at Offutt Air Force Base, near Omaha, Nebraska. An E-4B is denoted a "National Airborne Operations Center" when in action. Two of the original 747-200 airframes were originally planned to be commercial airliners. When the airline did not complete the order, Boeing offered the airframes to the USAF as part of a package leading to a replacement for the older EC-135J National Emergency Airborne Command Post (NEAP). Under the 481B NEACP program the Air Force Electronic Systems Division awarded Boeing a contract in February 1973 for two unequipped aircraft, designated E-4A, powered by four P&W JT9D engines, to which a third aircraft was added in July 1973. The first E-4A was completed at the Boeing plant outside Seattle, Washington in 1973. E-Systems won the contract to install interim equipment in these three aircraft, and the first completed E-4A was delivered to Andrews AFB, Maryland in December 1974. The next two were delivered in 1975, the third differed by being powered by the GE F103 engine, which was later made standard and retrofitted to the previous two aircraft. The "A" model effectively housed the same equipment as the EC-135, but offered more space and an ability to remain aloft longer than an EC-135. Additionally the E-4 was capable of operating the "Looking Glass" missions of the former Strategic Air Command (SAC). In December 1973 a fourth aircraft was contracted for, which was fitted with more advanced equipment, resulting in the designation E-4B. On 21 December 1979 Boeing delivered the first E-4B (AF Serial Number 75-0125), which was distinguished from the earlier version by the presence of a large "hump" on the dorsal surface directly behind the upper deck. This contains the aircraft's SHF satellite antenna. By January 1985 all three E-4As had been retrofitted to E-4B models. The E-4B offered a vast increase in communications capability over the previous model and was considered to be 'hardened' against the effects of electromagnetic pulse (EMP) from a nuclear blast. Hardening the aircraft meant that all equipment and wiring on board was shielded from EMP. Additional steps were taken to block radiation from the aircraft's cabin air management system and cockpit, including the novel use of the same screens used to cover the windows of microwave ovens placed over the flight deck windows. Estimates at the time of the production of the first E-4B placed the developmental cost at nearly US$1 billion. The roll out cost of the fleet was placed at approximately US$250 million each. In 2005 the Air Force awarded Boeing a five year, US$2 billion contract for the continued upgrade of the E-4B fleet. 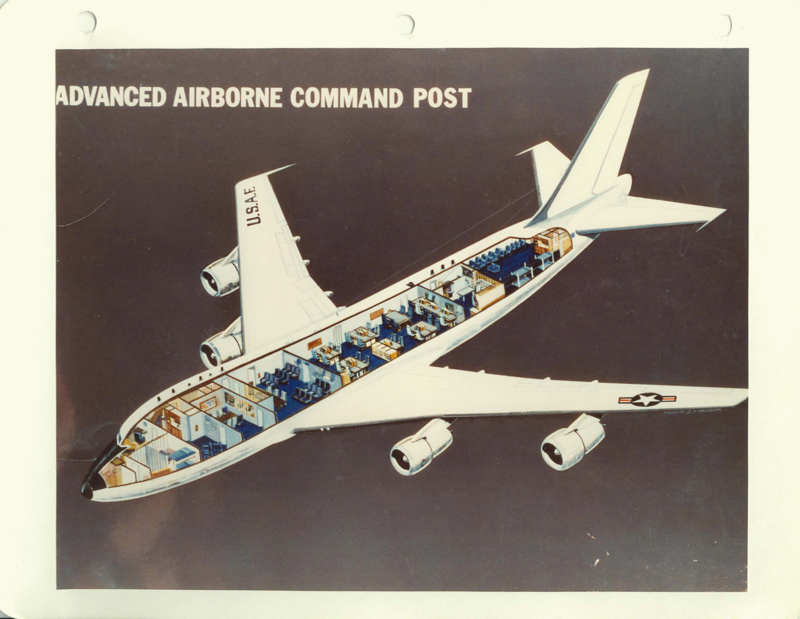 A right front view of an E-4 advanced airborne command post (AABNCP) (AF Serial No. 75-0125) on the electromagnetic pulse (EMP) simulator for testing. The E-4B is designed to survive an EMP with systems intact and has state-of-the-art direct fire countermeasures. Although many older aircraft have been upgraded with glass cockpits, the E-4B still uses traditional analog instruments, as they are less susceptible to damage from an EMP blast. The E-4B is capable of operating with a crew of 48 to 112 people, the largest crew of any aircraft in US Air Force history. With in-flight refueling it is capable of remaining airborne for a considerable period (limited only by consumption of the engines' lubricants). In a test flight for endurance, the aircraft remained airborne and fully operational for 35.4 hours, however it was designed to remain airborne for a full week in the event of an emergency. It takes two fully loaded KC-135 tankers to fully refuel an E-4B. The E-4B has three operational decks; upper, middle and lower. The flight deck contains the pilot's, copilot's, navigator's and flight engineer's stations, including a special navigation station not normally found on commercial Boeing 747s. A lounge area and sleeping quarters for flight crews and other personnel are located aft of the flight deck. The flight crew consists of an aircraft commander, co-pilot, navigator and flight engineer. The middle deck contains the conference room, which provides a secure area for conferences and briefings. It contains a conference table for nine people. Aft of the conference room is a projection room serving the conference room and the briefing room. The projection room has the capability of projecting computer graphics, overhead transparencies or 35 mm slides to either the conference room or the briefing room either singularly or simultaneously. The battle staff comprises force status controllers (3), emergency action controllers, operations controller, communications controller, intelligence planners (4), operations planners (4), logistic planners (4), chief of battle staff, airborne launch system officers (2), weather officer, reconnaissance planner, damage assessment officer and administrators (2), a total of 26; and communications operators (5), radio maintenance men (5) and switchboard operators (2), a total of 15. The Looking Glass missions were commanded by a general officer with two staff officers, while the National Airborne Operations Center (NAOC) may rendezvous and embark a member of the National Command Authority (NCA) from an undisclosed location. There are at least 48 crew aboard any E-4B mission. The aft compartment at the end of the main deck is the Technical Control (Tech Control) area. This area was the nerve center for all communications and communications technicians. Typically 3 of the 6 crew positions were occupied here by specialized US Air Force Technicians that were responsible for the proper monitoring and distribution of all communications power, cooling, and reliability. The Technical Controller #1 (Tech 1, TC1) was the direct interface with the aircraft Flight Engineer and Flight Crew. This position was also the main focal point for all communications related issues. The Technical Controller #2 (Tech 2, TC2) was responsible for maintaining all UHF communications between the aircraft and the Nightwatch GEP (Ground Entry Points). These GEP's provided 12 voice lines to the aircraft which were used in the day to day operations of the mission. Secure Voice was also provided. The SHF Operator (or technician) maintained the SHF satellite link and provided other worldwide communications services probably having replaced a lot of the UHF capabilities. Within the forward entry area is the main galley unit and stairways to the flight deck and to the forward lower equipment area. This area contains refrigerators, freezers, two convection ovens and a microwave oven to give stewards the capability to provide more than 100 hot meals during prolonged missions. Additionally, four seats are located on the left side of the forward entry area for the security guards and the stewards. The communications control area is divided into a voice area and a data area. The voice area, located on the right side of the compartment, contains the radio operator's console, the semi-automatic switchboard console and the communication officer's console. The data area, located on the left side of the area, contains the record communications console, record data supervisor's console, high speed DATA/AUTODIN/AFSAT console and LF/VLF control heads. The E-4B can communicate with the ground over a wide range of frequencies covering virtually the entire radio communications spectrum from 14 kHz to 8.4 GHz. Ground stations can link the E-4B into the main US ground-based communications network. The flight avionics area contains the aircraft systems power panels, flight avionics equipment, liquid oxygen converters and storage for baggage and spare parts. The forward lower equipment room contains the aircraft's water supply tanks, 1200 kVA electrical power panels, step down transformers, VLF transmitter and SHF SATCOM equipment. AC/DC powered hydraulic retractable Airstair is located in the forward right side of the forward lower equipment area, are installed for airplane entry and exit. In the event of an emergency, the airstair can be jettisoned if necessary. The aft lower lobe contains the maintenance console and mission specific equipment. The lower trailing wire antenna (TWA) area contains the aircraft's 5 mile long TWA reel – which is used by up to 13 communications links – the antenna operator's station, as well as the antenna reel controls and indicators. Much attention has been given to hardening this area against EMP, especially as the TWA, essential for communicating with ballistic missile submarines, is also particularly effective in picking up EMP. The E-4 fleet was originally deployed in 1974, when it was termed National Emergency Airborne Command Post (NEACP) (often pronounced "kneecap"). The aircraft was to provide a survivable platform to conduct war operations in the event of a nuclear attack. Early in the operations of the E-4, the media dubbed the aircraft as "the doomsday planes". The aircraft were originally stationed at Andrews Air Force Base in Maryland, so that the U.S. President and Secretary of Defense could access them quickly in the event of an emergency. The origin of the name "Nightwatch" comes from the richly detailed Rembrandt painting, The Night Watch, that depicts local townsfolk protecting a town; it was selected by the Squadron's first commanding officer. Later, the aircraft were moved to Offutt Air Force Base where they would be safer from attack. Until 1994, one E-4B was stationed at Andrews Air Force Base at all times so the President could easily board it in times of world crisis. When a President boards the E-4, its call sign becomes "Air Force One". (NEACP aircraft originally used the static call sign "Silver Dollar"; this call sign faded from use when daily call signs were put in use.) The E-4B also serves as the Secretary of Defense's preferred means of transportation when traveling outside the United States. The spacious interior and sophisticated communications capability provided by the aircraft allow the Secretary's senior staff to work for the duration of the mission. All E-4s were converted to B-models by 1985. With the adoption of two highly-modified Boeing 747-200Bs (known as VC-25A in Air Force parlance) to serve as Air Force One in 1989 and the end of the Cold War, the need for NEACP diminished. In 1994, NEACP began to be known as NAOC, and it took on a new responsibility: ferrying Federal Emergency Management Agency crews to natural disaster sites and serving as a temporary command post on the ground until facilities could be built on site. Evidently no E-4B was employed during the Hurricane Katrina Disaster of 2005, though one E-4B was used by FEMA following Hurricane Opal in 1995. The "cocked" or "on alert" E-4B is manned 24 hours a day with a watch crew on board guarding all communications systems awaiting a launch order (klaxon launch). Those crew members not on watch would be in the alert barracks, gymnasium, or at other base facilities. The 24 hour alert status at Andrews AFB ended when President Clinton ordered the aircraft to remain at Offutt unless needed, though relief crews remain based at Andrews and Wright-Patterson Air Force Base. One E-4B is kept on alert at all times. On 11 September 2001, an aircraft closely resembling an E-4B was spotted and filmed orbiting the Washington D.C. area by news outlets and citizens, during the attack on the Pentagon. This aircraft sighting has added fuel to the continued speculation and debate concerning the September 11 attacks. In his book Black Ice, author Dan Verton identifies this aircraft as an E-4B taking part in an operational exercise, saying the exercise was canceled when the first plane struck the World Trade Center. In January 2006, Secretary of Defense Donald Rumsfeld announced the entire E-4B fleet would be retired starting in 2009. His replacement Robert Gates reversed this decision in May 2007. The E-4B fleet is to remain in service until at least 2015. This is due to the unique capabilities of the E-4B, which cannot be duplicated by any other single aircraft in Air Force service, and the cancellation in 2007 of the E-10 MC2A, which was considered a successor to the EC-135 and E-8 aircraft, and could also perform many of the same tasks of the E-4B. In addition, despite its build cost, the E-4B is comparatively inexpensive to maintain and operate, as it uses the engines and structural components of the civilian 747. All four produced are currently operated by the United States Air Force, and are assigned to the 1st Airborne Command Control Squadron (1ACCS) of the 55th Wing at Offutt Air Force Base, Nebraska. Maintenance and crews are provided by Air Combat Command. Operations are coordinated by United States Strategic Command. Three produced; later converted to E-4Bs. No bulge (housing equipment) on top of fuselage. Powered by 52,500-lb CF6-50E2 engines. Has electromagnetic pulse protection, nuclear and thermal effects shielding, advanced electronics, and a wide variety of communications equipment. The E-4B plays a prominent role in two motion pictures. In the HBO film By Dawn's Early Light, following a nuclear strike by the Russians the aircraft serves as a flying platform for the presumed president, played by Darren McGavin. The aircraft is pursued by a Boeing EC-135 "Looking Glass", which is attempting to intercept it. In the motion picture The Sum of All Fears, the president and his staff travel on an E-4B following the detonation of a nuclear weapon by terrorists. In the novel, the Vice-president and his family are aboard Kneecap after terrorists explode a nuclear bomb in Denver while the President and his National Security Advisor are stuck at Camp David during a blinding snowstorm. National Geographic produced a television special on doomsday planning of the United States which includes footage from inside an E-4 during a drill. ↑ 1.0 1.1 1.2 1.3 1.4 1.5 1.6 E-4B fact sheet, USAF, October 2007, retrieved 8 May 2007. ↑ FAA Order JO 7110.65U, Air Traffic Control, Section 2−1−4. Operational Priority. FAA, 9 February 2012. ↑ Terdiman, Daniel. "Aboard America's Doomsday command and control plane". CNET.com, 23 July 2013. Retrieved 23 July 2013. ↑ 4.0 4.1 4.2 Michell 1994, p.265. ↑ Alwin 1999, p. 608. ↑ Bowers 1989, p. 528. ↑ "Boeing Awarded E-4B Product Support Integrator Contract". 21 December 2005. http://www.webwire.com/ViewPressRel.asp?aId=7248. ↑ Dendy IV, Staff Sgt. John B. "Around the clock with the E-4B". USAF Airman magazine, May 2000. ↑ 9.0 9.1 "American Doomsday" overview, video clip. National Geographic. ↑ 10.0 10.1 Jim Winchester. The Encyclopedia of Modern Aircraft. Thunder Bay Press, 2006. p. 264. http://books.google.com/books?id=bFXoPAAACAAJ&dq=the+encyclopedia+of+modern+aircraft&hl=en&sa=X&ei=KVe9Ud-aGqXCyAGxnICoBQ&ved=0CDcQ6AEwAA. ↑ Gilmore, Gerry J. "Rumsfeld Uses 'Flying Pentagon' To Communicate During Trips". US Department of Defense, 1 August 2005. ↑ "Photograph by FEMA News Photo taken on 09/16/1995 in US Virgin Islands". FEMA. ↑ 9/11: The mystery plane. CNN, 12 September 2007. ↑ Mystery 9/11 aircraft. The Raw Story, 13 September 2007. ↑ Verton 2003, p. 144. ↑ Francillon 2008, p. 37. Wikimedia Commons has media related to Boeing E-4.